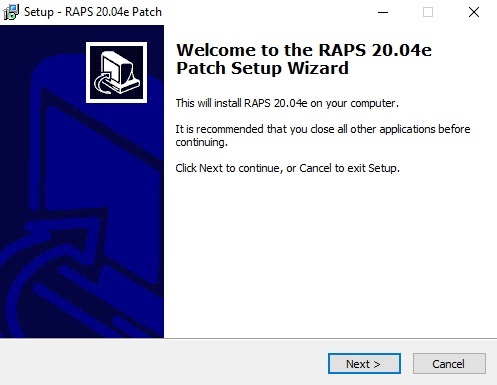 Download the RAPS 20.04e upgrade/patch installation package dated: 27th February 2016. • Remember to SAVE and not to RUN when asked after clicking onto the download button. • Before running this patch make sure that all workstations are out of the RAPS application. • Once downloaded double click onto the RAPS2004E_PATCH.EXE to upgrade your existing RAPS Retail & Rental Counter software. Note Windows will always prompt you to allow unknown software to be installed...please allow since our software is not malicious. • Note this patch must be run on all workstations that use the RAPS Retail & Rental software. • Full support for Internet Star Light shopping cart. • Allows for the update of Shipping/Mailing Rates displayed on Star Light. • Monitor incoming purchase orders. • Monitor abandoned shopping carts. • Confirm purchase orders and personalized email message to purchasing customer. • Exchange of rental items had small bug that if exchanged item returned in the following day that it would not update the audit record with the return date (now fixed). • Raps will now process retail movie stock cards for Internet Meta data. • Setting Special day does not accumulate bonus points if loyalty program switched on. • Added retail support for the online StarLight component. • Pictures can be taken of Retail Stock Items within the Retail Maintenance Window...these pictures will then appear on the StarLight retail section. • Product home web page address(url) and product YouTube links can be captured to relevant stock cards within RAPS. These links will then be visible to your online StarLight customers perusing your retail stock. • Have added new fields to the Maintain shop details function. This amendment will allow the store owner to set the currency for the country that they are in. Refer to the help button within the Maintain shop details function found under the tools drop down menu. • In this new patch StatLight gets stronger it is radio-active, it is a free add-on to RAPS that allows your rental and retail catalogue to be viewed and interacted with by your potential Internet customers. The store manages its own web site with a simple tools provided by the Software clinic. To read more about StarLight please read the following PDF document Starlite-maintenance.pdf. • The RAPS Backup option is provided under the Tools menu drop down list. This backup function has been enhanced to allow User's to backup onto a User defined manual backup path such as a memory stick that can then be taken offsite for safe keeping. Or a backup can be scheduled to automatically backup onto a User defined backup path on their computer, which may also be defined to www.dropbox.com or to www.drive.google.com. If defined to dropbox or drive.google then these additional free backup services will pickup your backup and save it onto their servers for safe keeping. To be able to make use of the free dropbox or drive.google the User must register with the service provider that suits them to get a free backup service; these free backup services currently start at +-2gig of free backup space.